Key facts about the Latino vote in 2016: A projected 27.3 million Latinos are eligible to cast ballots in 2016, representing 12% of all eligible voters. Here are key facts about the Latino vote. I am happy to share this website and these analyses (see tables below) conducted by the Cooperative Children's Book Center (CCBC) at the University of Wisconsin-Madison. These statistics are abysmal in terms of the number of children's books published annually that are either by or about people of color and Native American and Indigenous people relative to the general population (primarily Anglo). Even just a cursory review shows how institutionalized racism is profound from the very important and influential vantage point of our nation's children's text book industry. I remember several years ago when I first became apprised of how serious this problem of insufficient numbers of culturally and linguistically relevant texts actually is. In the 1990s and throughout the 2000s, as a mother of two small children at the time, I remember thinking and experiencing this problem with respect to a paucity of Latina/o children's books first hand. My husband and I sought to foster our daughters' biliteracy with Spanish-English, bilingual texts that additionally developed in them an awareness and appreciation of their heritage. It was an uphill climb to say the least. I've commented previously on my blog with respect to the racist text book battle currently under way with the Texas State Board of Education. The kind of racism reflected there is no different from the racism of our nation's textbook industry both of which reflect a deeper bias and emotional commitment by those in power that frankly prefer to perpetuate a culture of racism that is so profound that it's the air that we breathe. Even for minorities themselves, including our civil rights and activist communities, one of the last things on their/our minds—which helps to explain why more hasn't been done in this regard—are culturally and linguistically relevant children's books. This is not at all the case for our bilingual/dual language and ESL teachers in our nation's schools who must struggle daily in their schools and with their districts for inclusion. It's not easy to teach bilingual or dual language education in classrooms that lack books, or insufficient numbers, and curricula developed out of community-based knowledge and histories. The CCBC began collecting these data on book published more than 30 years ago. It documents an expansive time period during which precious little has changed. In stark contrast to our nation's changing demographics, this is a massive problem that deserves focused attention, discussion, and resources in every school throughout the U.S. As you will be able to see from this piece, this is what we are actually attending to in Austin, Texas (see additional resources below). This is not simply a technical fix, but rather involves challenging institutionalized racism and other forms of oppression with respect to textbooks and curriculum for children of color. What makes it "institutionalized" is its far-reaching and systemic nature such that in reflects deeper societal values that are themselves culturally chauvinist, on the one hand, and from an equity perspective, actually compensating for years and indeed, decades, of neglect vis-a-vis children of color in our schools. However, if you need a definition of "institutionalized racism," here is one from the National Education Association. Rather than being apologists for the current system, we need to stop oppressing our children by systematically denying them access to their stories, histories, and identities. We need to reverse the effects of this curriculum by not only waging and winning high-profile battles such as that against the SBOE, but also by disrupting institutionalized racism in everyday ways. 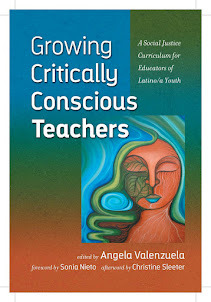 More substantive yet is an alternative vision that is additive, asset-based and anchored figuratively and literally in our communities themselves as there is much work to be done in order to reverse mindsets that grow out of the received, subtractive, culturally eviscerating curriculum that is the air that we breathe. Accordingly, we need to get close to the ground in our communities and organize in and with them so that we can get the teachers and children the resources that they need to teach the way that they know how to teach. Here is a published piece on Academia Cuauhtli titled, Academia Cuauhtli and the Eagle: Danza Mexica and the Epistemology of the Circle by Angela Valenzuela, Emilio Zamora, and Brenda Rubio, here. Briefly, our community-based organization, Nuestro Grupo, started a legal partnership with the Austin Independent School District (AISD) and the City of Austin and inaugurated a Saturday academy, a language and culture revitalization project named, "Academia Cuauhtli," that serves 4th and 5th grade children from Sanchez, Metz, Zavala, and Houston Elementary Title I AISD schools in Austin, Texas. I cannot even begin to tell you how awe-inspiring partnerships can be when we are all on the same noble and worthy path of addressing the issue of equity in our schools through our focus on curriculum development, teacher preparation, and children's books. We can all only grow from this vast and sacred task of educating our children in ways that expand their, as well as our, sense of the possible not only for themselves, but for their families and communities, as well. School district administrators and teachers also benefit by engaging authentic knowledge and pedagogy that reflect lived experience in ways that make schools and life, generally, meaningful and fulfilling. I certainly hope that this is helpful. Peace and blessings to all. Starting in 1994 we began also keeping track of the numbers of books by Asian/Pacific and Asian/Pacific American, First/Native Nation and Latino book creators as well. We also began documenting not only the number of books created by people of color and First/Native Nations authors and illstrators, but the number of books about people of color and First/Native Nations, including the many titles that have been created by white authors and/or illustrators. We examine everything that comes into the CCBC annually in order to determine what gets counted. This includes picture books, novels, and non-fiction. We receive hardcover and, these days, more and more original paperback trade books typically available for sale to public schools and public libraries, as well as some (but not all) series/formula non-fiction titles (e.g., a "Countries of the World" series including titles such as Kenya and Venezuela). We do not include reprints of previously issued books in our count. As noted above, the CCBC receives most of the trade books published annually in the United States. The titles the CCBC receives also include a limited number of series or formula non-fiction books, and books from several Canadian publishers that distribute in the United States, and these have also been included in our multicultural counts when applicable. More recently, we've begun receiving a small number of books distributed by a few U.S. trade publishers with a U.S. price label, but not in a U.S. edition. The four broad groupings we use do not represent cultural specificity; we track this in the annual records we keep listing the individual titles. Our Latino log, for example, is organized by specific region and then country or heritage group within it, so a book about a Cuban American child, or a book about or set in the Domincan Republic or Mexico, is recorded as such. A book about Aztec people living in Mexico would be recorded in both the American Indian and Latino logs. We count a book as "about" if the main character/subject is a person of color, or if we are able to determine based on examining a book that a person of color features significantly in the narrative. So a novel in which the main character is white will be included if we are able to determine a secondary character of color is important in the story. We do not count a book if the principle character is white and there are a range of secondary characters, including characters of color, but none of the characters of color seem to play a significant role. This is, of course, somewhat subjective; we talk about the books that we can't easily discern. We do not want to misrepresent a book as having multicultural content; likewise, we make every effort not to miss those that do. In recent years, we have seen more fiction with diverse casts of characters, or picture books with no specific cultural content but featuring a character of color, and this has impacted our numbers. Likewise, paperback series publishing has had an impact on the numbers, as had the fact that some publishers outside the realm of traditional trade books are now sending us their titles because they are aware that we are maintaining these statistics. The multicultural content across the books about people of color and First/Native Nations represented by the numbers we document varies widely with regard to accuracy and authenticity. Additionally, the number of books we document each year created by authors and illustrators of color does not represent the number of individual book creators of color—often a single individual has written or illustrated more than one book published in a given year. And not every book created by an author or illustrator of color, counted in the "by" cateogry, contains cultural content. If it doesn't, it is not included in the "about" number. Likewise, if a book about an African American family is illustrated by a Chinese American illustrator, it would be counted as "by" in the Asian Pacific category, and "about" in the African American category. If the author of the book is Black, then the book would also be counted in the "by" category for Africans and African Americans. Does that mean the remaining books are all about white people? No. Even though we don't document the number of books about white people, we know there are certainly picture books books published every year featuring animal characters or trucks or other high-interest topics; and nonfiction about aspects of the natural world, etc. But what we know from being immersed in children's and young adult literature each and every day is that white people are not notably, or even noticably, lacking in books for children and teens. However, CCBC Director Kathleen Horning did do a mid-year check in 2013. You can read what she found on the CCBC blog. More important, what the low numbers for multicultural literature mean is that publishing for children and teens has a long way to go before reflecting the rich diversity of perspectives and experiences within and across race and culture. The numbers are far from the only important thing to consider when it comes to multicultural publishing for children and teens, of course. The books themselves matter. And every year we see amazing books by and about people of color and First/Native Nations people published. There just aren't enough of them. The more books there are, especially books created by authors and Illustrators of color, the more opportunities librarians, teachers, and parents and other adults have of finding outstanding books for young readers and listeners that reflect dimensions of their lives, and give a broader understanding of who we are as a nation. Across the years, we've seen evidence of the importance of small, independently owned publishers as contributors to a significant body of authentic multicultural literature for children in the United States and Canada. The commitment of individual editors at both large and small publishing houses also has made an impact. We have also noted the importance of children's book awards in calling attention to outstanding work created by and about people of color and First/Native Nations people. We enourage you to visit our multicultural literature page for links to mulitulcultural literarture awards and other resources. And we know the difference we all can make in purchasing and sharing books by people of color and FIrst/Native Nations individuals in our professional and personal lives. Sales matter to publishing. The books themselves matter to children and teens, who deserve to see the rich diversity of their lives and the world in which they live reflected in the books around them each and every day. Note: in addition to compiling annual statistics, we also include an essay sharing our observations about the publishing year in the introduction to each edition of CCBC Choices, our annual best of the year list, and this always includes comments on multicultural publishing. (Recent essays.) The statistics below may not always correspond to those in the Choices commentary for that publishing year. Discrepancies occur when we receive books after the deadline for including the numbers in the print publication. The table below represents the most accurate accounting. We update these statistis as additional titles trickle in. The SPLC on the "Trump Effect." Art and Activism always go hand in hand.